Jenni Burton is an experienced sales & marketing professional with a passion for developing content marketing strategies and evaluating how those strategies drive leads, customer loyalty, and purchase. Her past positions include Account Executive at Pattern 89, Social Media Manager at Simon Malls, and Associate Director of Digital Marketing at Herff Jones. 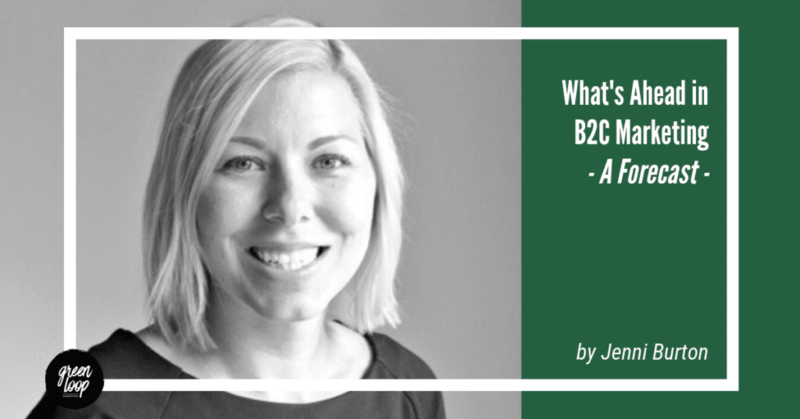 When we wanted to learn what other marketing pros see as the upcoming trends in B2C marketing, we knew we had to reach out to Jenni. Instead of giving us just one thought, she replied with an impressive list of predictions. And while most of these are focused on B2C markets, B2B businesses can learn quite a bit from this forecast as well. Social Ads Will Keep Winning. Social Ads Will Get Creepier. I have no doubt that as consumers in 2019, we will continue to see social ads become more and more relevant. Over the holidays I had several conversations with non-marketers about how many of their purchases were driven off of Instagram and Facebook. This isn’t just anecdotal—72% of Instagram users report buying something after seeing it on the platform. The targeting capabilities for advertisers on social networks is beyond compare. Functions like look-alike audience targeting allow the Instagram-marketers of the world to keep crushing it, testing new messages and expanding their consumer base. The use of AI and data science in social ads (shout out to my friends at Pattern89, amongst others) will help primarily B2C companies continue to see improved ROAS (return on ad spend). There is a risk for these companies to be too creepy and aggressive, which can backfire as more consumers become aware of tactics and ads, Really, this is an issue of privacy, and I don’t see an end in sight for social ads in the B2C retail space (especially around new customer acquisition in beauty, fashion, and health). If you haven’t done so yet, it’s really fun (and easy) to check out your own targeting criteria for Facebook and Instagram — chances are you’ll be amazed as to how spot on the platforms are (some of my friends said they felt like Instagram knew them better than themselves!). Amazon Will Keep Winning, But There Will Be An Eventual Backlash. Deciding whether to sell your products on Amazon or not can be one of the biggest questions for a B2C company—if done right, it can be transformational and drive volume and scale. And for many brands, Amazon feels compulsory as shoppers demand “Amazon-like” shipping costs, timeframes, and customer service policies from all eCommerce retailers. However, brands that decide against selling on Amazon will continue to have good justification to their customers to opt-out—rising platform advertising costs, house brand copycatting horror stories and complicated seller policies are just a few of the reasons why brands are choosing no. Additionally, B2C brands who sell through Amazon miss the ability to own the entire buying process and can often not maximize the consumer relationship on their own terms (and won’t even get an email address of their buyers.) This limits the all-important follow-up cross-selling and seasonal opportunities. This one has little data behind it, but is a gut feeling I have: the rental clothing companies and a bulk of the subscription boxes are hitting their peak or will in 2019. Articles like this make it feel like we’ll all be renting our clothes in the future. Logistics, hassle, and emotional attachment to clothing will stand in the way of this being the new norm. Fast fashion companies have largely pushed clothing costs down to a level where buying a new outfit for an occasion is the status quo (for better or worse) and the average consumer (note: not hyper-brand aware) will continue down this path and the clothing subscription companies will be forced to focus on niche occasions and markets. When it comes to subscription boxes, the gifting and special interest markets are where these will shine in the future—especially around pets and kids. However, the novelty of a subscription box for the sake of receiving something every month has worn off for most buyers and many have been let down by at least one in the past where the value diminished over time or the items were not relevant. Note: I do however think that the borrowing and renting economy outside of clothing still has enormous potential—both via eCommerce as well as more-localized. The idea of tool libraries is one of my favorite things and could imagine this working in a variety of other areas. GDPR rocked most marketers into more conservative practices last year, but I believe it’s just the beginning of new privacy regulations, expectations, and best practices. A good deal of the targeting capabilities and tech have been out there for years—but as consumers are more educated, more companies are taking advantage of the technology and margins get thinner in some spaces. This leads to SUPER aggressive tactics. The issue is getting the attention it deserves. One of the biggest areas I see getting hit is mundane apps that share location data about users, but also expect to see better preference centers when it comes to data sharing and more upfront information from top brands as they proactively move forward with improved transparency. Be sure to pay attention to what the US version of GDPR might look like as this could have more mandatory changes to how consumer data is handled and utilized. It’s an amazing time to be a marketer (and consumer!) 2019 will be exciting for both, but my biggest tip is that a solid strategy, knowing your consumers, and strengthening your product x market fit will always trump the tech in-and-of-itself and where the magic happens is when you successfully merge the two. Thank you to Jenni for sharing so much insightful information about B2C marketing. Be sure you don’t miss Imarketing trends, tips, and advice. 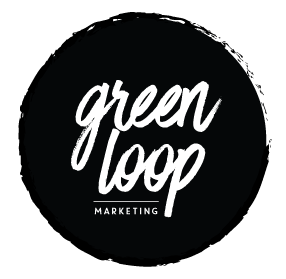 Sign up for our emails (opt-in below) and stay In The Loop!